Manufacturer of a wide range of products which include wind breaking shade net. Our organization is an emerging manufacturer and supplier of a vast range of Wind Breaking Shade Net. To ensure these shade nets' compliance with international standards, we manufacture these using finest quality raw material sourced from renowned vendors of the market. Before dispatching these wind breaking shades to the market, the manufactured products are stringently checked on several quality parameters and norms. 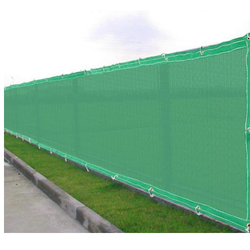 We are known as one of leading Wind Breaking Shade Net Manufacturer and Wind Breaking Shade Net Exporter. Looking for Wind Breaking Shade Net ?